Hobbies, Long weekends, Holidays, whatever it may be, your boot is usually overflowing! The Ford Kuga is your new best friend, with a spacious boot and a selection of engines that can handle any terrain. 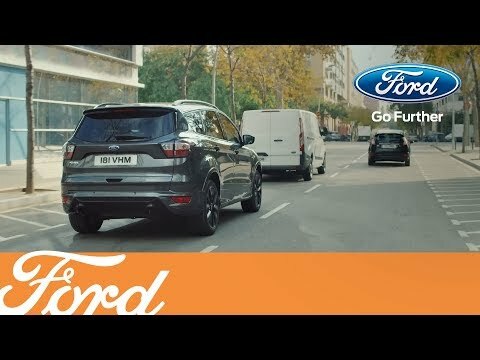 Fords Sports Utility Vehicle, the Kuga, is a visually stimulating car with a strong road presents. Ford have continued the kinetic design philosophy across the range, with the wide three bar chrome grill on the Kuga Zetec and Titanium Edition, catching your attention instantly. The headlights are beautiful sculptured, which helps bring together the overall look of the car, making it never look out of place. Ford have also condensed the rear lights, given the body work powerful contours, as well as making alloy wheels standard across the range, providing a muscular and dominating feel. The height of the Kuga, gives you easy access, fantastic visibility and superb comfort all in one go. The leather steering wheel and gearshift knob, leaves the Kuga with a luxury feel to it, that just makes it a happy place to be. Air conditioning and electric windows are standard across the range, along with partial leather seats from Titanium Edition up, as well as an electronic parking brake which is far less labour-intensive than its equivalent. With a great selection of optional and standard features, your Kuga can suit all of your life’s adventures, even if it’s just a trip to the shops. The Kuga can come with an 8” touchscreen blue tooth system, that controls the Sat Nav, DAB radio and your phone, as well as displaying the image from the rear-view camera if you wanted one. On top of this, the Kuga comes with keyless entry on the Titanium Edition, Enhanced Active Park Assist on the ST-Line, or a power opening panorama roof on the ST-Line Edition. On top of all this, the Kuga comes with a 5 star NCAP safety rating, scoring 100% in the Safety Assist section. The Ford Kuga offers a choice of engines, transmissions and drives, with both petrol and diesel options available on the car. There are 5 different power outputs, ranging from 120ps in the 1.5 diesel engine to 182ps in the 1.5 petrol engine. This choice in engines gives the Kuga a maximum recommended towing limit of 2100kg, meaning its ideal for most caravans, horse boxes and or trailers.